We'll be back soon, turned out to be two days later. This climbing stuff gets in your veins and you can't get enough!! I love the challenge ... just to see if I can do it. 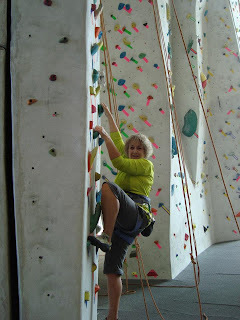 Admittedly I am the oldest at the climbing gym ... Ofie is 5 years younger. Beyond that, I don't think I have seen any women over 35!!! Of course they can climb circles around me!!!! Here is a picture off the website that shows more of the inside. The structures are called walls ... covered with hand and foot holds. 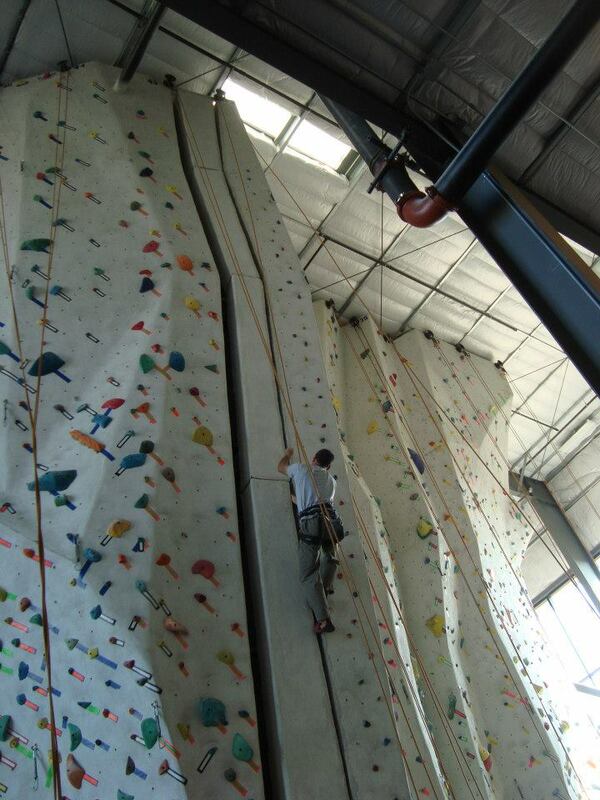 You can climb to the top using any holds you want, but most people try to follow the route. Some routes move around corners and out as you ascend. Those are my favorite!! 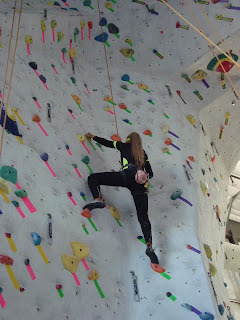 There are several ways you can climb ... bouldering uses no ropes ... just you and your hands and feet. These walls are not as tall, so when you fall, you won't break something. Top ropes are what we use ... attached at the top around a pulley so if you fall, the rope stops your descent. Lead ropes are attached to your belt and lay on the floor. 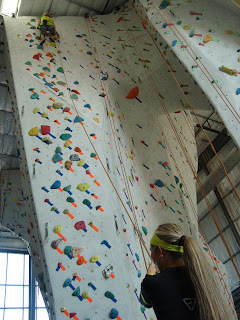 As you lead the way up the climb, you attached the ropes to clips in the wall. Quite a fall before the rope catches you if you slip. 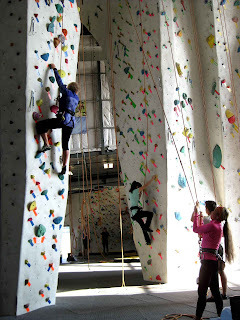 This type of climbing is what Ofie and I want to learn. My theory is that if you are afraid of heights, just don't look down. After one warmup climb at 5.7, I spent the rest of the day on 5.8 climbs. I completed one hard climb with two overhangs just because this guy remarked that he couldn't do it ... he just kept falling at the second section (He's behind Ofie in the picture below). That's a challenge in my book. Yes it was really hard .. I was hanging on for dear life using every bit of strength I had ... but I was going to do it no matter what!!!! Ofie just laughed at me!! Wish I had more pictures, but we always have to ask someone to take them for us. Belayers have to keep both hands on the rope. 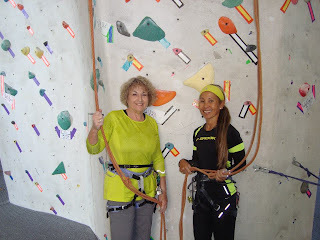 We have several people who want to try climbing ... they saw our pictures on facebook ... so next weekend we will be back. Once we get them started, it's 5.9's for me!!!!! Although my friend Ofelia and I were supposed to hike to the top of Yosemite Falls yesterday to work off that Thanksgiving meal (and what a great meal it was!! ), she woke up with a screaming headache and didn't feel like hiking up one of the hardest trails in Yosemite. Since I had been up since 4:00 am agonizing over the turkey dinner prepared by an Escapees RV group at the Los Banos Fairgrounds, I wasn't too disappointed!!! Later in the morning, Ofie called and asked if I was up to climbing. 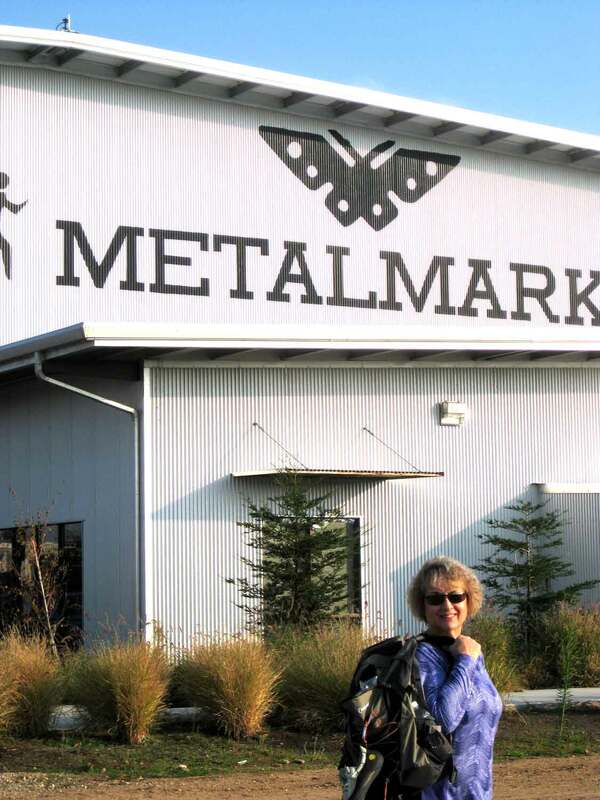 I NEVER turn down a chance to climb, so we made arrangements to go to the new Metal Mark climbing gym in Fresno. She invited her son-in-law-to-be Ryan to go with us since he had the day off, Ofie's daughter Nina had to work at Mercy Hospital. 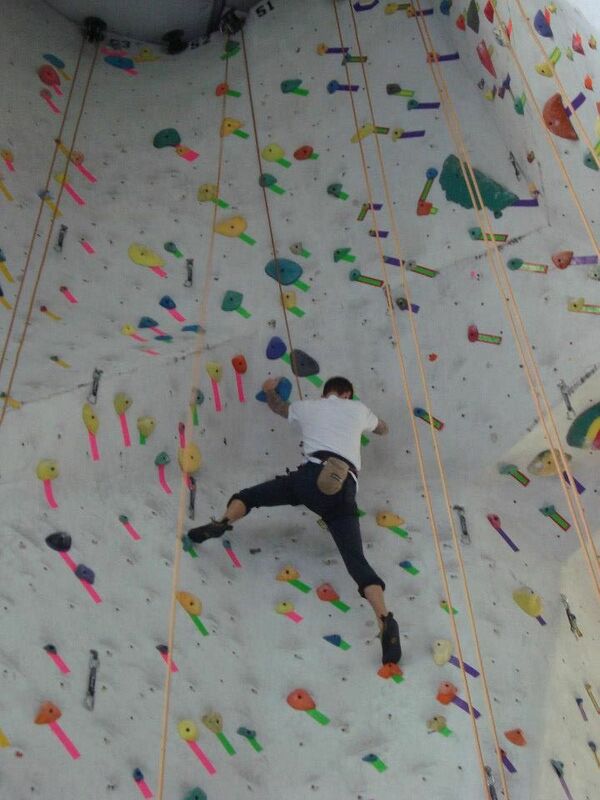 Since climbing must be done in pairs, another friend Scott was invited. 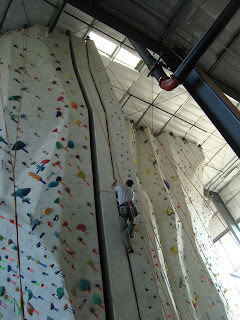 Before you are allowed to climb at a facility, you must sign your life away (yes, it is a dangerous sport if you act stupid and don't follow the rules), then they actually give you a test to see if you know what you are doing when it comes to attaching your harness and stopping a climber who has fallen. 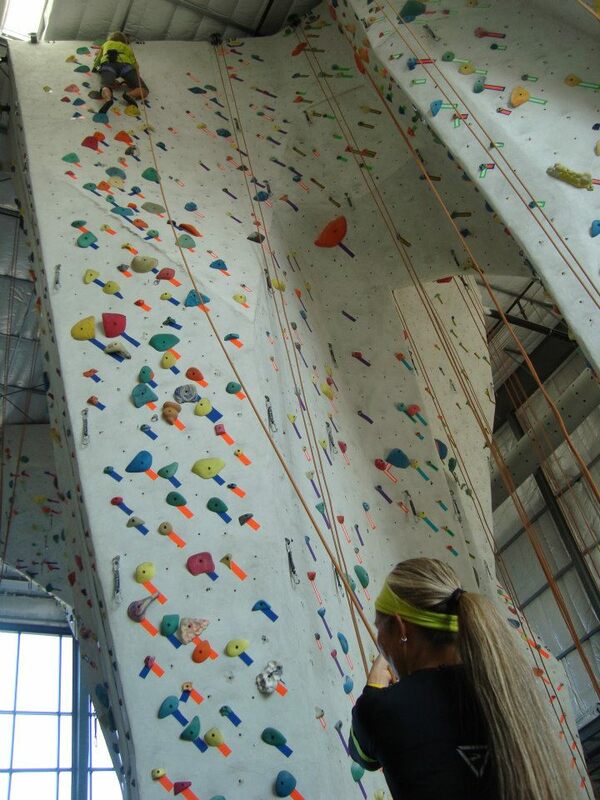 Your partner is your belayer ... you free climb up the wall while they keep the slack out of your rope. If you do fall, they can stop your descent easily and fast, so you only crack your knee and elbow on the wall!! They pretty much have your life in their hands. 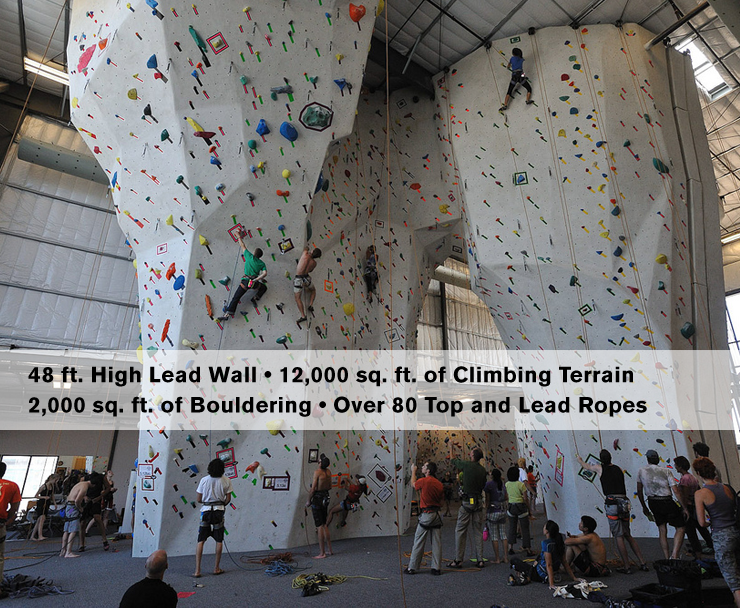 For safety they do have a 12" thick cushion on the entire floor ... just in case your belayer isn't paying attention!! You can see all the colored stickers on the walls by the hand and foot holds. They indicate which holds are related to the climb rating. Climbs are rated from 5.5 to 5.13 (and some even higher) by their difficulty. 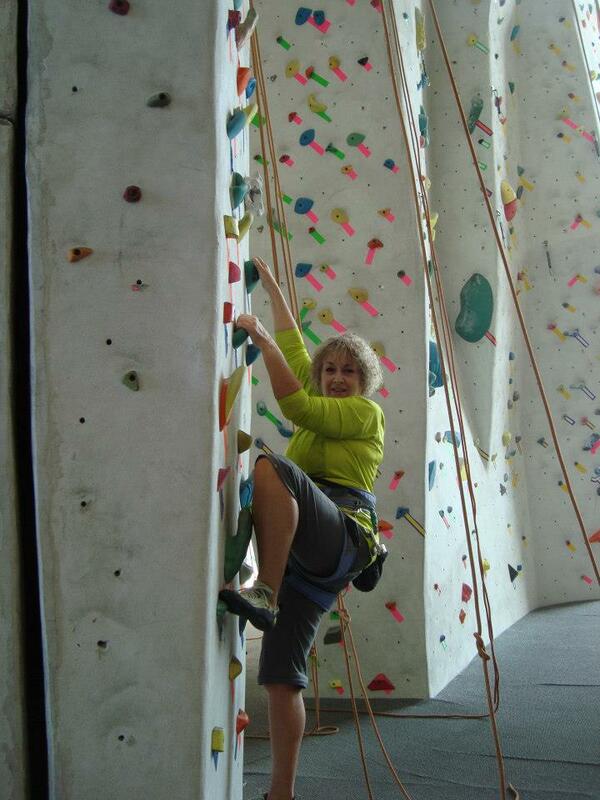 Higher difficulty means smaller (teeny tiny) hand and foot holds, much farther apart! The other very important thing to note at this gym is that all the climbs have one or two overhangs, meaning the walls are slanted OUT at the top. I didn't realize this at first. It didn't take me long to go find the TWO straight walls when I got tired!!! 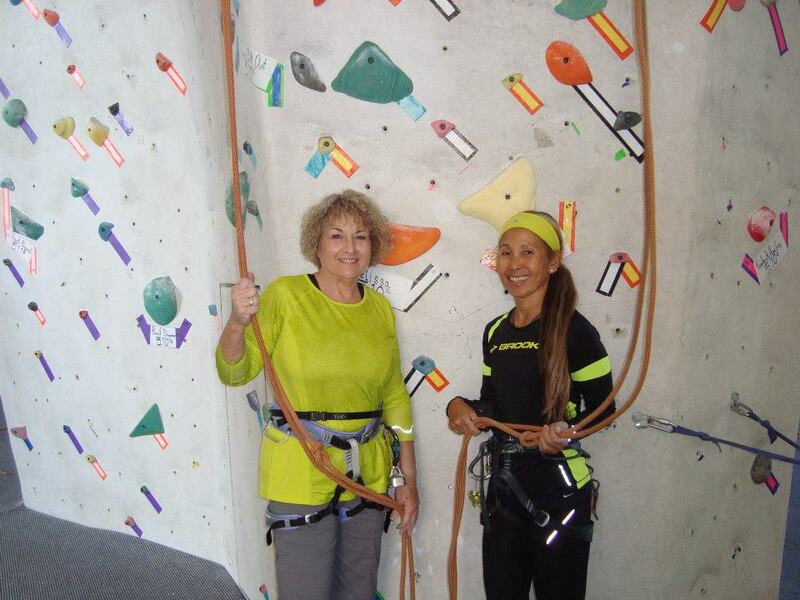 I'm at the top of a 5.7 wall here with Ofelia belaying me. You definitely want to have TRUST in your belayer. Oh and you can cheat ... you can use any hold you want if you get tired ... but it's more fun to try and stick to the difficulty level. I got up to 5.8 ... next time I'll start with 5.8 and try a few 5.9's. It's tough when you feel like you are almost upside down. When you are hanging at a 45 degree angle, pushing with your feet and clinging with your fingernails, it's hard to let go and reach for another hold without fear of falling off. Yes, I've seen guys (and girls) climb literally parallel to the ground upside down!!! Pretty sure I won't have to worry about that though!! I'm belaying Ofie here ... she's on a 5.10 route. Ryan up higher, climbing the same route Ofie just climbed. You could blow both of them over with a feather they are so skinny ... but all muscle!!! The bags hanging off their backs are for ground chalk. You put quite a bit on your hands before you start to climb (and during if you need to) ... it helps you hold on to the rocks without slipping. They also have crack climbs. Ofie and I don't like crack!!!!! But Scott likes trying the hard stuff. You insert your hand into the crack, turning your wrist and spreading your fingers so your hand is the anchor that holds you up. Unfortunately, your hands end up a bloody mess ... the walls are concrete!!! Hope everyone has a wonderful Thanksgiving full of friends and family!!! 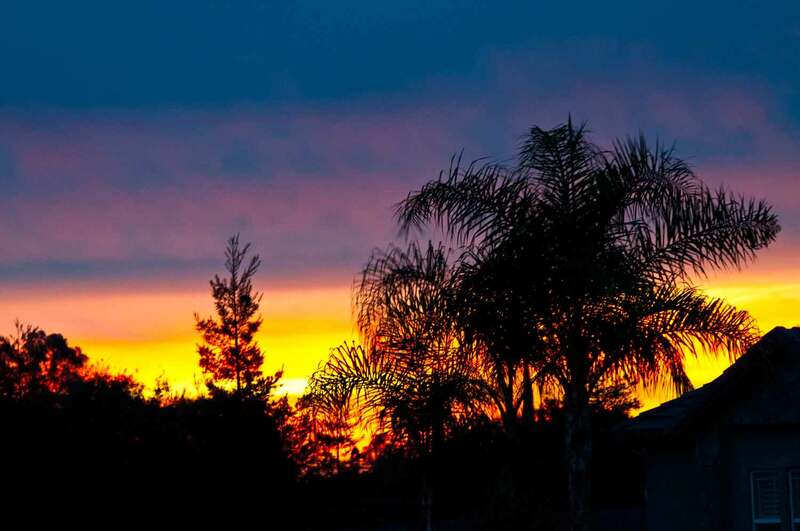 All Quiet on the Central California Homefront!! Not much going on here except cold and rain. I'm supposed to be on a training schedule for running another marathon next year. Of course shopping and decorating take a front seat, so I'm a little behind. This morning, after turning off my sprinklers which were watering my already soaked front yard, I headed out the door for a four mile run in the rain. It wasn't bad actually since I run better in really cold weather. It was running against the wind that slowed me down considerably. Once done, you feel great ... for about 30 minutes ... then the achey breaky pain hits. To combat the after affects, I take a product called Recoverite by Hammer. It's specifically designed to reduce the inflammation of torn muscle fibers and promote healing and rebuilding. Sounds awful ... and it is. No one said running was pain free ... it's fun, but it hurts!!! And trust me, this stuff tastes like crap!!! LOL It does, however, work, so I hold my nose and chug it down, followed by breakfast. In about 4 hours, I should be able to stand up and walk again!!!! Not being able to get out due to the weather, I decided over Veterans Day to set up my Christmas Tree. Since I'm in the "back to my roots" mode, I scrounged around until I found western and cowboy type ornaments. This is no small task, since the tree is 8 foot tall. I know ... it's not real!! I would love to have a real tree ... but over the years I've cleaned up enough pine needles. I put on one row at a time, then run the lights on that row. Much easier this way. While putting the tree up, I thought it might be a great idea to use my healing rope as garland. There are two kinds of ropes used in working cattle ... heading and healing. Just as it sounds, one is used to catch the head and one to catch the heals, each having a different construction and feel. The length was just perfect!!! More lights, some ribbon and ornaments and it started to look pretty good. A trip to Beverlys Fabrics resulted in a dozen cute ornaments at a sale price of $3 each, however on a later trip to Walmart I found more of the exact same type for $1.97 each. I'm beginning to like Walmart more and more!! Almost done, I just need the last box of ornaments. Too bad I can't find them!!! Last year I decided to put them somewhere in the house instead of the garage. That wasn't a good idea at all, because now I can't find the last box. Oh well ... I'll keep looking!! I have a few days left. All this hard work deserved a cookie ... except I didn't have any. A quick check of the kitchen and I had all the ingredients to make these Apple Oatmeal Butterscotch cookies again. These definitely don't help my running, nor my eternal weight loss program, but boy do they taste good!!! I'm starting to stiffen up all over, so best get up and moving or I'll be perched on the couch for the next two days. Thanksgiving is coming and it's time to hit the grocery store for supplies. Maybe even Walmart to see if they have any new ornaments!!!! Thanksgiving ... Time For Cooking!!! Thanksgiving was always a big deal in our family ... we went to someone else's house!!!! Although we always took food, dinner was the same old thing, year after year. Don't get me wrong, I LOVE turkey, mashed potatoes and dressing!! Throw in a little cranberry sauce and I'm happy. With the internet making delicious recipes readily available however, I try to come up with something a little different each year. Here's my vote for 2012!! Butternut Squash Soup!! I know, squash isn't my favorite either ... and certainly NOT squash soup. That said, you should try this one, maybe a small batch first. It's easy peasy to make and delicious!!! Peel one small butternut squash, clean out the seeds and mucky stuff ... and CAREFULLY cut it into one inch chunks. Let your husband do the cutting if you wish ... it's rather hard to cut ... worse than a large potatoe!!! Peel two apples, Braeburns, Fijis, any kind that are sweet and juicy and cut into one inch chunks. 2 tbl sugar and chicken broth til it's not quite covering the chunks. Bring to a boil and simmer for 30-40 minutes (uncovered) until soft and tender. Hit it with a potatoe masher or an immersion blender, being careful not to get it all over your stove (it takes about 20 minutes to clean up ... this is experience speaking!!!). Garnish with grated apple (or carrot .. or both) and top with a few chopped pecans. That's it .... done!!! I really don't like butternut squash .. but I LOVE LOVE this soup. Okay, I confess, I kind of stole this recipe from a local lunch restaurant. I figured out what it had that I liked, and I came up with this recipe. I just like that it's so quick to make ... and so tasty!! If you don't like it, freeze your leftovers and mail it to me!!!!! P.S. There was one more Yahoo that came in the mail today. I drink phony coffee ... by that I mean General Foods International Coffee, Orange Cafe. The cheapest, I mean least expensive place to purchase it is Target. Trouble is, the last time I was in that store, they had a sign that said "sale, discontinued". Nooooooooooo!!! My coffee of 30 some years is discontinued??? Can't be true!!! A quick tour around all the local markets, and sure enough, no one is carrying it any more. Then, ZING ... out of the blue I thought to check Walmart On-line. Yahooooooo!!!! 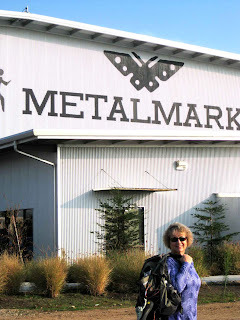 Not only do they have my coffee, at $3.00 a can (cheapest price ever) ... but FREE SHIPPING!! I ordered two cases. And there's MORE!!! No sales tax ... and a large bag of samples, makeup remover and enough "Simple" face cream to last me six months. Now THAT's a YAHOOOOO!!!! I admit it ... I have a sweet tooth! A REALLY BIG sweet tooth ... like the whole left side of my mouth!!! After making oatmeal apple butterscotch cookies (what's not to like in that!! ), I made banana pineapple bread with mini chocolate chips. When I heard that recipe, I said Yuck!! But after tasting some, it's the bomb!! Further internet searches resulted in a recipe for chocolate cookie "flats" dipped in melted chocolate and crushed anything-you-want! My excuse is that I'm "trying them out" for Christmas gifts. Hahahahaha ... everyone who knows me knows I'm going to eat MOST of them!! My list of dipping items included heath bars, mini chocolate chips, M & M's, pecans and Oreo cookies. I'm walking down the cookie aisle and what should I find??? PEANUT BUTTER OREOS!!! I'm in heaven ... did you know they made these?? Perfect for the cookies, if in fact there are any left by the time I make them!! These are soooooooo good (you can see I've already been in the package) !! The first YaHoo was after 12 phone calls, I finally got my 2012 Season Skiing Pass transferred to 2013. Last year I had a surgery that kept me from skiing the entire season. Dodge Ridge Ski Resort is a great place to ski ... Peter and I go almost every weekend. If you have a verified Doctor's medical excuse for the entire season, they will transfer that ticket to the next year. It took a little time, since I sent the first email in February .... but they finally called to say it was done. That's a $300 savings for me!!!! YaHoo!!! The second YaHoo is that I have located a contractor (hard to find in this area) who will build a storage garage like this for my motorhome in my back yard. The first problem involved the setbacks ... the Planning Department told me 15 feet. The contractor says he does these all the time and the setback is 5 feet. I worked in the Merced County Building Department for 10 years .... unfortunately, the employees have changed, as have the rules and the attitudes!!! 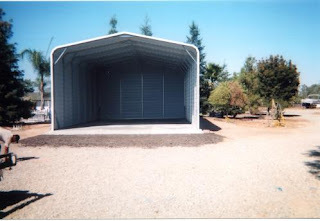 Then there are CC&R's for the subdivision, saying they have to approve any "building" ... does that mean carport?? I'm so thrilled that the contractor has agreed to handle everything ... even if it means moving the horse barn and dog kennels in order to get the building up. This is a BIG YAHOO!!!!! I'll keep you informed of the progress!!!! 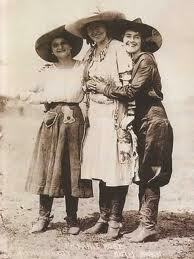 Cowgirl .. A Beautiful Woman With Dirt On Her!!! Well I don't know about the beautiful part ... that's not me ... but a woman with dirt on her describes me perfectly!!! I spent yesterday cutting and hacking at my neighbors trees that hang over on my side of the fence, making a big mess of sticks and trash. I jump up, grab on to the end of the branch, pull with all my might braced against the fence, then cut and run!!! The whipping action of the branch retracting unfortunately dumps loads of trash on my head, including big ugly bugs!!! I discovered I need a bigger pair of shears!!! Finally done, I came in a big dirty mess. Even my dogs were eyeing me sideways!! About that time, I remembered the cowboy hat I purchased in Sedona Arizona. I mentioned I would show you a picture ... then forgot about it while in Hawaii ... not exactly cowboy country!! If I had lived in the 20's and 30's, this is what you would find me wearing. My boots are the most comfortable pair of shoes I own!!! 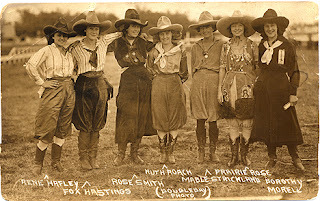 These are actually rodeo cowgirls ... they roped and rode broncs!! I love the old clothes ... and have a couple reproduction pair of riding pants, but have been without the hat for some time. I did find an old rolled brim Stetson that I still have, 40 years later, but have been looking for something like these FOREVER!!! As Patty and I walked down the streets of Sedona, I noticed several western clothing stores ... we went in and out of each one very quickly. Until ......... 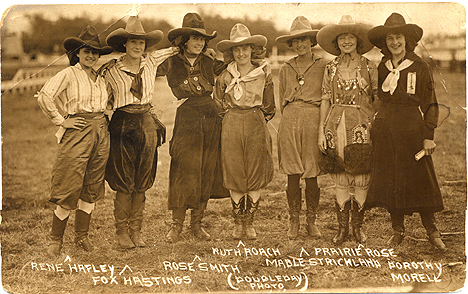 I saw the hats and clothing we had seen the "rustlers" wear on the train. It stopped me in my tracks!! I tried on every hat in the store ... with people laughing all around me!!! No, it's too small!! Noooooo it's too big!!! I ignored all of them when I put on this beauty!! It's just what I had been looking for!!! Patty's comment was ... well it IS big, but if it's what you want, you should get it!!!!! Sloped crown, very w i d e brim, perfect color and it fits!!!! This isn't the best image ... my arm isn't long enough to get the whole effect. You just have to see it in person!! I'll be in Indio and Quartzite in January. If you see this big hat roaming around, stop and say howdy!!! They're B a a a a c k !!!!! Just like the swallows ... except for their looks ... the Kissack Castle namesakes have returned!! 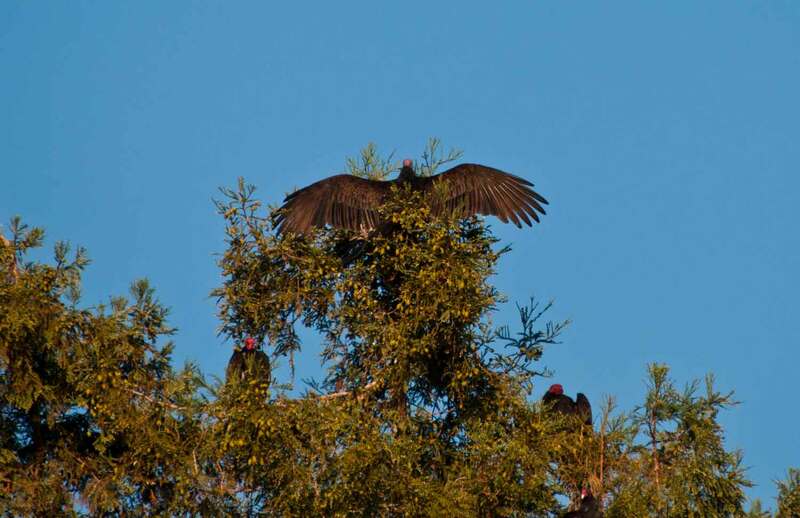 Buzzard Roost is again surrounded by dozens of buzzards, lending their own kind of beauty to my back yard. Really, they are pretty disgusting!!!! This morning I woke up to this gorgeous sunrise in my front yard .... made me think of Hawaii!!! A short trip to the back yard however, dampened my Hawaii spirits. 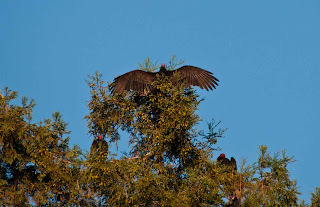 Stacked across the treetops were my old friends the turkey vultures!!! Cold early mornings will find them at the top of trees and lined up along my back fence, wings spread as if in flight ... trying to soak up all the warm they can. There are three in this image ... can you find them??? Thankfully the trees are all located on my neighbors property ... no mess for me!!!! It is kind of unnerving having them circling my property, just waiting for something to die in my back yard. Sorry guys, you'll be here a long time before that happens!!! It does however, make it easy to find my house .... I just tell people to look for the birds circling overhead!!!! The World Champion Giants came home with a roar!!! No matter what the city, the baseball champs are welcomed home with a ticker-tape parade and lots of pomp and circumstance!! Thousands of people flocked to San Francisco yesterday for the big event. Having gone through this in 2010, I chose to sit this one out at home. The traffic from people going to work is crazy enough, but add to it another million people and it's too crazy for me. Fans were lined up at 2:00 am in front of the Civic Building to claim their perfect vantage spot. What they didn't know is that everything is blocked off around the building for over one full block. That then, is the closest you can get ... at the edge of being able to see nothing and hear nothing!!! So I watched it all on TV and had the BEST vantage point!!! I even yelled and whooped it up a little!! These are all I-phone pics so you can see the festivities. The parade was great ... this year they all rode in cars driven by San Francisco Forty Niner Football Players, a great improvement over last years Trolley Cars where you couldn't see the guys. They drove up Market Street from the Ferry Building to the Civic Center, I think about 3 miles maybe? Fans lined the street on both sides chanting "Lets Go Giants" over and over. At the Civic Center, they were all introduced to screams and yells that you could barely hear on TV because they were so far away. Boring boring speeches by the Mayor and Upper Management ... you would think THEY won the trophy ... and FINALLY they got to the REAL winners ... Bruce Bochy and the Team!! I didn't think to take pictures until later in the program ... here's Hunter Pence, the Preacher, a recent addition to the team. He preached constantly to play for the name on the front of the jersey, not the one on the back. Boy did that work well!!! Blanco, outfielder and Lincecum, pitcher. You can see by the pictures, they are all individuals!!! Vogelsong and Posey, pitcher and catcher ... basically responsible for winning everything. Buster Posey played every playoff and world series game except one. He's the one calling the pitches, and he's VERY good at his job ... besides that, he hits home runs quite often. He didn't play at all last year due to a broken foot from being slammed at home plate. The guy on the left with sunglasses looking like he's holding a flag, is Pablo Sandoval, Panda Bear to his fans. He's holding the World Series MVP trophy. In game one ... three times up, three home runs!!! In 2010 he didn't get to play in the World Series ... he made too many errors, many said due to his weight. So he lost 50 pounds and came back swinging!!! Bottom right with red hair ... pitcher Matt Cain. Threw a perfect game ... first time in 45 years of baseball history. Next to him in the sunglasses, my favorite Barry Zito. With a $127 million contract, his pitching went downhill and he didn't play in 2010 either. At the beginning of this year he completely changed how he throws the ball ... and was responsible for the winning game that got them back on the road to winning the World Series. So many stories about these guys ... it's what keeps me going back every year. Pretty bad pictures taken of my TV with my phone ... but better than I would have gotten in San Francisco!!! Finally, our old friend Tony Bennett came to sing the famous song we hear at the park every single time the Giants win a game ... "I Left My Heart in San Francisco". Can you believe it???? This man is 86 years old and still sounds like he's forty. When Buster Posey stood at the podium three years ago and said "lets do it again!! ", no one really thought that would become a reality. The three west coast announcers, all radio and television personalities including the great Vida Blue, admitted that not one of them thought the Giants would be here ... and yet here they are again ... because they played for the name on the front ... not the name on the back. An amazing diverse group of men ... it's been my pleasure to know them!! !